Economic inequality has exploded in recent decades—globally, in Canada and here in BC. Much of our concern about inequality has focused on the growth of extreme disparities between the incomes of the very rich and those of us on the middle and lower rungs of the income ladder. But there’s been much less focus on the related problem of wealth inequality. Wealth—or net worth—is the sum of all individual or family assets (house, car, financial investments, etc.) minus all debts (mortgage, credit card, student loan, etc.). In other words, what a household would have after selling all assets and paying all debts. The work of French economist Thomas Piketty, and his weighty tome Capital in the Twenty-First Century, has helped put the issue of wealth inequality on the agenda. Piketty argues that returns to capital ownership are outstripping economic growth itself. In other words, those who make money from their existing wealth—rather than those who make money from their labour—are amassing a growing share of global wealth. This is neither socially nor economically justified, Piketty explains. This view dovetails with recent findings from the OECD and IMF, which have begun to sound the alarm about the damaging effects of inequality on economic growth. The typical top-10 BC billionaire is 5,845 times wealthier than the typical BC household. When it comes to wealth inequality in BC, there’s plenty to be concerned about—25 billion reasons to be concerned in fact. That’s the combined net worth of the 10 wealthiest families in BC. Together, they have the same wealth as the bottom 1.32 million British Columbians combined, more than a quarter of the province’s population. In fact, your typical top-10 BC billionaire is a whopping 5,845 times wealthier than the typical (median) BC household. As noted, the 10 wealthiest families in BC together held $24.9 billion in net worth. The typical British Columbia family (the “median,” right in the middle of the wealth distribution) has a net worth of $429,400. In contrast, the median of the 10 billionaire families has a net worth of $2.51 billion. 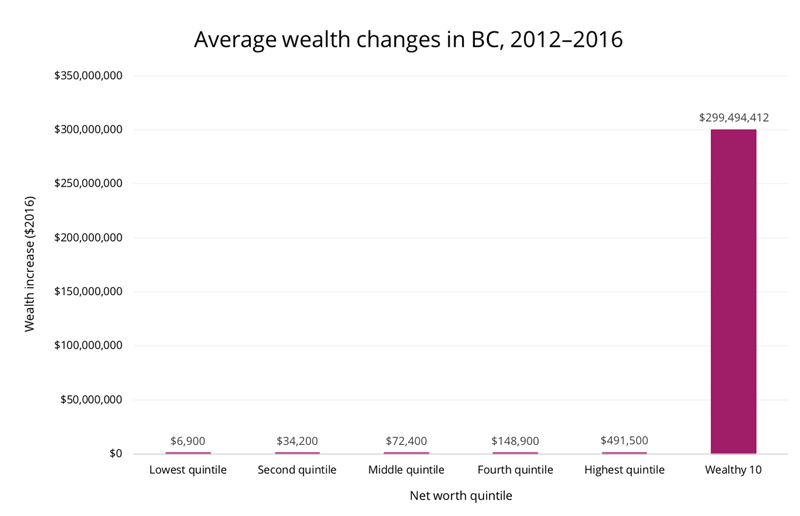 Furthermore, these richest 10 families increased their net worth by an average of $299 million each between 2012 and 2016, dwarfing the gains of other BC families, even those who are relatively well off (see figure below).2 The total wealth of the 10 richest families rose by about $3 billion over this period. Who are the top 10 wealthiest British Columbians? The top 10 wealthiest BC families include some familiar and less familiar names—see the table below. In addition to their extreme wealth, BC’s wealthiest families have other things in common. First, much of their wealth is inherited. Seven of the 10 fortunes are in their second generation or more, which means those billions aren’t solely the result of hard work or earned success. They’re a result of privilege—being born with the proverbial silver spoon in your mouth. Source: Canadian Business and authors’ calculations. Why does extreme wealth inequality matter? Some would say these disparities in wealth are nothing to worry about, that raising concerns about them is a case of envy or that such inequality is inevitable. Extreme inequality is not inevitable and does have important implications. First, it’s a reminder that we are one of the richest societies in the world. We are often told it would be far too costly to tackle urgent problems like the climate crisis, the housing affordability crisis or poverty and homelessness. In reality, our province is enormously wealthy, but we’ve allowed this wealth to be amassed by the richest few. We outline solutions below for this state of affairs. International evidence also shows that inequality is corrosive for society and is associated with a host of negative social outcomes. This research shows that countries with more income inequality are likely to have lower life expectancy, worse health outcomes, higher crime rates and lower levels of social trust. These outcomes appear to be worse up and down the income scale—not just for the poor—suggesting that inequality is bad for everyone, including those who are better off. Inequality is also fraying an already threadbare social fabric. Public confidence in political institutions and “political classes” is in long-running decline across the developed world. Political instability is on the rise, along with right-wing populist movements that promise to save the middle-class by scapegoating vulnerable groups. If a bold agenda tackling massive inequalities in wealth and power is not advanced, these more ominous political forces seem poised to fill the vacuum. What can we do about extreme wealth inequality? Strikingly, public policies have often made the growth and persistence of wealth inequality worse rather than better. BC saw a significant erosion of tax fairness over the past two decades and Canada’s tax system privileges income from owning capital compared to income earned from work. For example, capital gains are taxed at half the rate of labour income and generous tax credits apply to dividends paid by Canadian corporations to their shareholders. Canada is also the only country in the G7 without an inheritance tax, which allows vast fortunes to be passed along from one generation to the next. The CCPA has called for an inheritance tax of 45% on estates over $5 million, which would bring Canada in line with the rest of the G7.4 Only about 1.8% of BC families have net worth over $5 million. An inheritance tax of this type would both reduce inequality and raise $2 billion per year nationwide, which could be used to make crucial public investments that benefit everyone. Investments in services like health, education, child care and housing are great equalizers, ensuring everyone’s needs are met effectively and efficiently, levelling the societal playing field and binding us together. In BC, we’ve long called for progressive property taxes that would require the wealthiest landowners to pay more. Doing so would make our property tax system fairer—especially since the rising value of urban land is created collectively by all of us (through public investments in infrastructure like parks, schools and transportation). This year, the provincial government took some important steps that will help capture more of this massive land value for the public good, including the Speculation Tax and additional School Tax on residential properties over $3 million. These new taxes are narrowly targeted, requiring only 1–2% of the wealthiest property owners to pay more. To tackle BC’s inequality in real estate wealth though, more needs to be done to reshape the property tax system along progressive lines. Taken together, our recommendations would go a long way to reduce the damaging levels of wealth concentration in this province and country. To find a path out of what is an increasingly frightening political moment around the world, we need to act decisively against extreme inequality. This is also an opportunity to take back control and harness our enormous wealth for the common good. For comparability with the Statistics Canada data, our analysis uses Canadian Business’s “Canada’s richest people 2017,” which was published in late 2016. The 2018 edition is available, but there is no corresponding Survey of Financial Security (SFS) data. There are some differences in the concept of “economic family” used by Canadian Business and in the Statistics Canada data, which are discussed further in the CCPA’s national report on wealth concentration. For example, families as compiled by Canadian Business, if their members live at more than one address, would be counted as more than one family under the SFS. All numbers are reported in inflation-adjusted 2016 dollars. A 2012 estimate for the Aquilini family was not available so the 2013 estimate was used (drawn from Canadian Business’s “Canada’s richest people 2014″). Canadian Business doesn’t explicitly identify real estate holdings for Jim Pattison, but the Jim Pattison Group has a real estate division, which claims to own and manage over 13 million square feet of properties. The least real estate-invested in the top 10 would appear to be Brandt Louie, for whom the magazine puts real estate investments at 2% of his fortune—about $40 million. See the Fair and Progressive Taxation Chapter of the 2018 Alternative Federal Budget, “Getting there,” Canadian Centre for Policy Alternatives, February 2017. See Peter Spiro’s Tax Exemptions for Investment Income: Boon or Bane? Mowat Centre, February 2017.